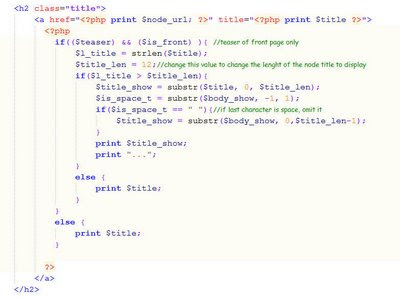 In continuation to my previous post about ”Taming Drupal Node Title and Teaser” this is part 2 of the Drupal node title and teaser taming tweak by editing node-type.tpl.php. (type is your content type like story, project or custom type like news or project etc). This is what your teaser for front page look like after the tweak is applied and after some great theming :-). 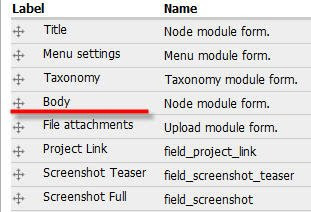 The previous Node title and teaser tweak works for content types that have just two fields Node Title and Node body and may be file attachments. Now picture a custom node type called project that has node title, node body, a link to the project and a screen-shot of the project. 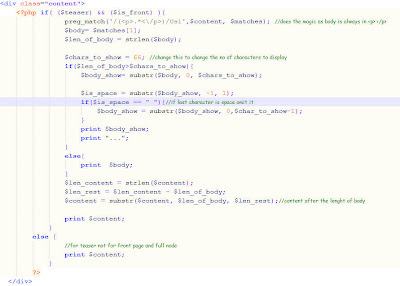 In that case the previous tweak will not give desired output so here is the code to tweak your title and teaser. In this tweak if the last character is space then it will also be cut/omitted from the display making it look better like it would display “Saathi Sanga…” rather than “Saathi Sanga ..” the space there. As the previous tweak it is targeted for teaser for the homepage. It was done in Drupal 6 but for Drupal 5 also see that Body is above other fields you created. The above code will make your teaser be of just 12 characters for the front page only. tag for the script to work. To make it look this cool you must do great theming. The text file is also uploaded to scribd here if you want to analyze the code in full screen flash interface. I hope it helps your Drupal development and custom Drupal Theming, HAPPY THEMING.